If you're looking for black party supplies, then we have just what you need. The range includes plain black paper cups, plastic tables cloths, 3-ply napkins and paper plates. Everything is ready to be delivered directly to your door in time for your party or celebration. They are perfect for special occasions in the home, at the office or for a public fund-raising event. 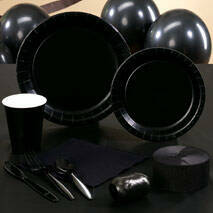 Black party supplies add a sophisticated elegance to a celebration. They can be used to create some drama with your decorations. Mix black with silver or gold for a bit of bling; this look is really popular for a New Year's Eve event. A bright colour like purple mixes well with black, creating a show-stopping look for a wild-at-heart party. If you are hosting a black and white party, use the black cups and plates and add a bunch of black foil balloons or some white flowers in tall vases and you have an elegant table decoration. At Halloween time it’s fun to decorate the party table in black and orange. Use our plain black tablecloths as the foundation for your masterpiece and cover the top with spider webs, pumpkins and bats. Be creative with the food and drinks served and make the event a ghoulish night to remember. As well as all the party supplies you need, The Party Warehouse has a huge range of Halloween costumes for men, women and children. Order your party outfit from us and dress up in spectacular style this year. There are also Halloween masks, wigs and props available.